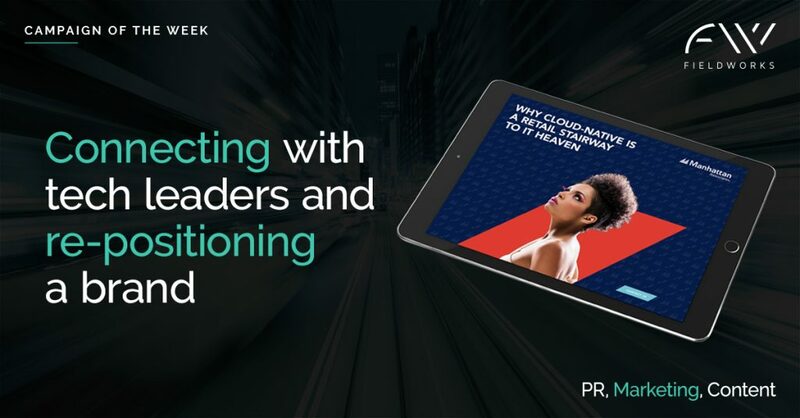 When Manhattan Associates needed to generate quality retail leads for its new cloud-based computing solution it enlisted Fieldworks Marketing. The objective was to re-engage with the retail CIO/CTO community and establish Manhattan Associates’ credibility as a cloud-first innovator. Fieldwork’s solution was a fully integrated, multi-channel campaign targeting CTOs and CIOs which clearly explained what a ‘cloud-first’ strategy means, its benefits and drawing a clear differentiation between cloud-native solutions (offered by Manhattan Associates) and the inferior cloud-enabled solutions (offered by competitors). 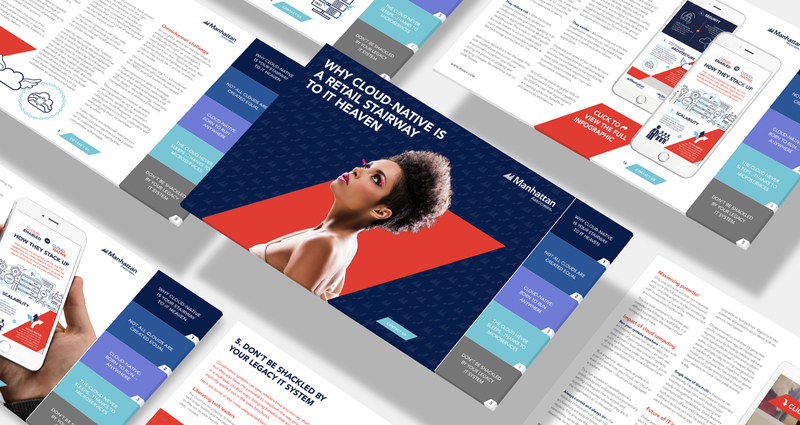 The aim of the campaign was to develop a compelling narrative that cloud-native solutions were best and using content marketing to position Manhattan Associates as a leading innovator. Fieldwork’s content had to resonate with Manhattan Associates’ retail prospects, showing the company understood retailers’ challenges and pain points around digital transformation. Each of these 15 assets was independently deployed by Manhattan Associates using email and social media as well as shared as a single interactive pdf. The Fieldworks campaign targeted key retail IT decisionmakers and budget holders. This was made up of four personas (CIO, CTO, head of IT and head of IT architecture) at 138 prospect companies in three sectors (retail, brand manufacturing and wholesale) across four territories globally. Manhattan Associates’ brief was to deliver multichannel assets that could be spread over a six-month campaign. The assets had to be self-contained and individually deployable, but they also had to come together to form a single piece of hero content. Five ghost-written opinion pieces, each addressing a key aspect of cloud-first computing written on behalf of the Manhattan Associates CTO Sanjeev Siotia. These opinion pieces were delivered to the client as fully designed pdfs. Five infographics supporting each of the ghost-written opinion pieces with detailed additional information. 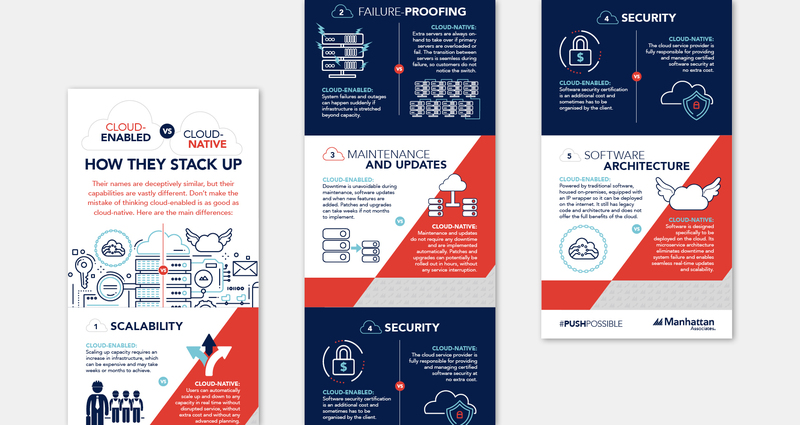 These infographics were also delivered as fully designed pdfs. Five short videos of the Manhattan Associates CTO discussing the benefits of cloud-native computing. Manhattan Associates deployed these individual assets using LinkedIn, Twitter and email, driving traffic to the full interactive pdf on the company’s website. The initial campaign results have been very promising with click throughs on email, follows and engagement on social, downloads on the web and an influx of inbound enquiries all being above normal for Manhattan Associates’ past campaigns and the piece is driving some great conversations. Crafted as an awareness programme rather than pure lead generation Manhattan Associates have been known for one thing and they needed to shake-up the market to ‘see’ the new innovations that they are bringing to market. The cloud campaign was aimed at helping that shift in perception.